New cards! What did you expect, hex tiles? 4 Games in One Review! Kind Of! 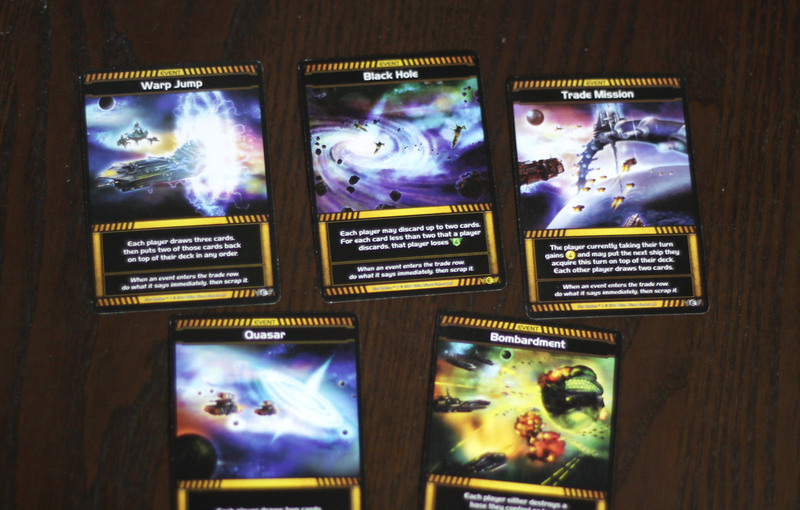 Do you love Star Realms? You wouldn’t be alone. Since its release, the little indie game that could has rocket up the popularity charts. 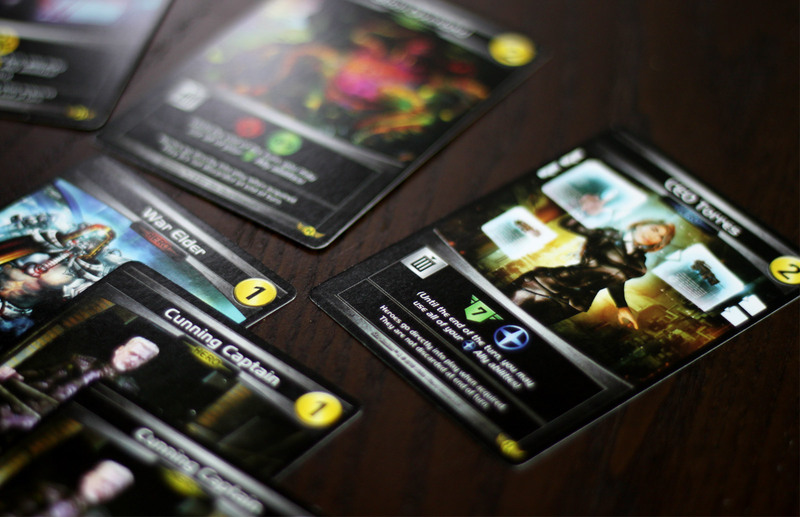 A combination of the slick gameplay, portable size, and incredibly low price point (About half the cost of similar deckbuilding games) have solidified its position in the gaming world. Yes, it’s got a lot of luck-induced gameplay. Yes, it’s similar to Ascension: Chronicle of the Godslayer. It’s still a whole lot of fun to play. 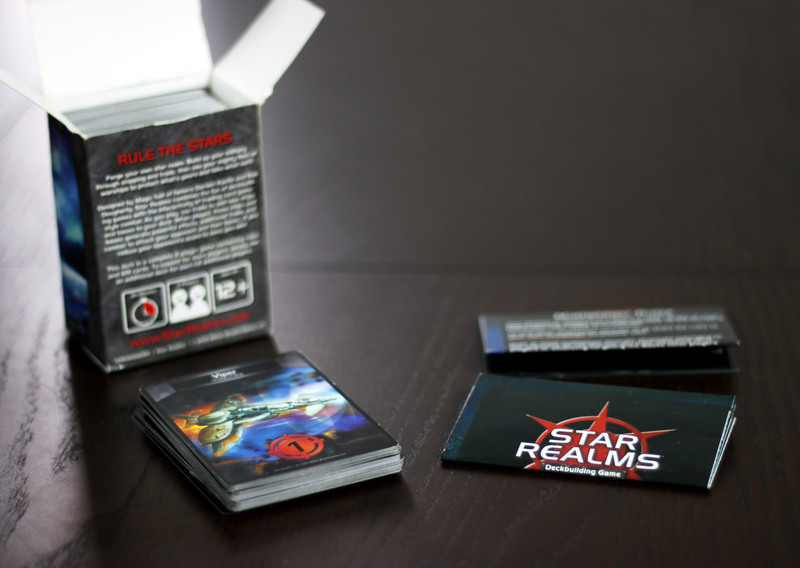 Star Realms: Crisis is actually a set of 4 mini-expansion packs that can be purchased individually. Each pack contains 12 cards centered around a different theme or mechanical element; those 4 packs are titled Fleets & Fortresses, Bases & Battleships, Events, and Heroes. I’m here today to give you the rundown on each of them. 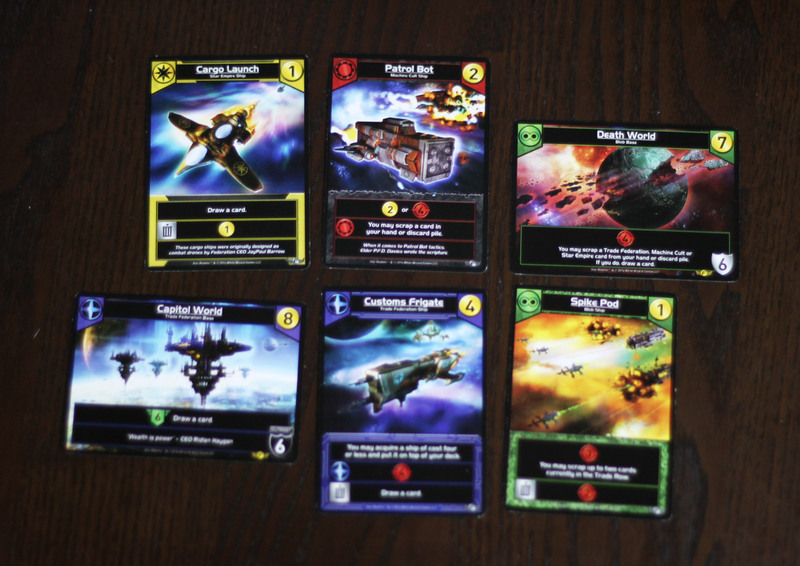 If you are not familiar with Star Realms, go ahead and saunter on over to our review, then get yourself to a game store and buy a copy for a measly $15. After you’ve played a few rounds, come back here and enjoy the rest of this review. Okay, moving on. The first two packs, Fleets & Fortresses and Bases & Battleships, simply add a number of new ships and bases to each faction. There are no new rules added to the game. Each new ship or base adds new combinations of abilities. Events is the first game changing pack. Event cards are not cards you can buy, but they do get shuffled into the deck. However, when an Event card is revealed, it has a global effect that is immediately resolved. It may force players to discard, allow them to draw extra cards, or make players choose between losing Authority and Destroying one of their own bases. Once an Event is resolved, it is scrapped and a new card shows up in its place. Heroes also switches up the gameplay slightly. The pack includes 2 generic and 1 unique hero per faction, but they’re a little off the beaten path as far as normal cards go. Hero cards are very cheap – costing 1 or 2 trade. They also go immediately into play when you purchase them, and never get discarded. They have no hit points or authority, so they cannot be destroyed. However, they have no active faction or per-turn ability, save one; each hero has a Scrap ability. When scrapped, the Hero activates their faction icon along with another limited ability. Shall We Play Another Game? 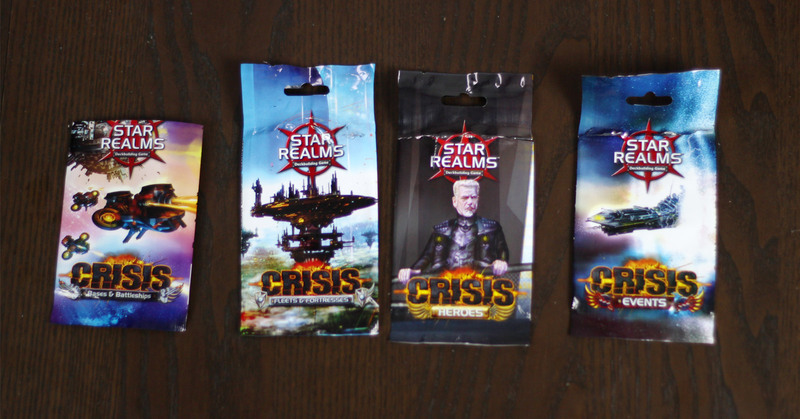 I’m guessing, if you’re still here, you’re a fan of Star Realms and you want to see if these new Crisis packs are worth getting; they’re certainly not going to convert you if you don’t already enjoy the game. If you want something to tone down the luck element, well, you’re out of luck. So are these little guys worth adding to your game? Probably. The two that just add more ships or bases, those are really up to you. I mean, I highly recommended grabbing them, but they’re not really changing up the game. They add new combinations of powers, but don’t really add new powers anywhere. But, the way powers are mixed does switch up your strategy a little bit – a ship that lets you draw a card but whose attack is locked in the Allied Faction zone is a little different than a ship with an attack that lets you draw a card with the Allied Faction ability. A little different. Still, the new ships and bases add a little more variety to a game you may have played a hundred times and seen all the cards. So go ahead, add ’em! It’ll be fun. Seriously. They’re really cheap! Of all the packs, Heroes is my favorite. These cards really do add something new to the game, and with only a slight rule addition. First of all, it’s nice to have something more to spend that leftover 1 trade on – of course, a cheap hero has to be out there for you to buy it – and then it gives you one chance to negate the luck of the draw. And by that I mean, the primary purpose of a Hero is to unlock an Allied Faction ability. You know you’ve had plenty of turns when you just didn’t get a faction ally in your hand and if you had it would have made such a big difference. Well, the heroes go straight into play and stick around until you use them. After all, they’re HEROES – you can always count on them. So if you can get one for the right faction, suddenly you have an option when you draw that hand that needs an ally. The Hero can come to the rescue. Thematic, functional, and fun! The heroes have returned! You deserve medals! It’s a one-time use ability, though, so you still have a choice to make. Is now really the right time to use up your Hero? It’s a choice but it keeps it within the fast-paced arena in which Star Realms is most fun. You won’ t need to hem and haw over what to do. These cards do tend to be more useful early on in the game – usually, later in the game you’ve built up your deck so that non-allied cards are rare. Still, there is that rare situation that pops up. Plus, later in the game is when you tend to have those extra trade dollars to spend and you don’t really want to add more Explorers. Heroes don’t go into your deck so they won’t mess up future hands. Since they have a little ability of their own in addition to the faction, they’re always worth a purchase if you can spare the coin. In case it wasn’t clear, I love the Heroes pack. It’s my favorite of all of these. If you buy nothing else, buy this one. It’s only $4. Now, Event cards are a different story. They certainly add more randomness to the game, and if you like randomness then I guess you’ll be all right. However, if you’re someone who likes Star Realms but would prefer to tone down the randomness instead of spike it up, you may want to stay away from Events. Here is the thing though; the event cards are at least interestingly designed. In theory. Events affect everyone, so you’re not going to get something that just kills you without also hurting the other players. You almost always have a choice of penalty, and then there are some good events that give you a boost. The main issue I have with Events is that, while they technically affect all players equally, in practice they tend to affect the current player the worst. I think the problem lies in timing. Events come out most frequently when you buy a new card, which frequently happens near the end of your turn when you’ve played all your cards. That means, even if you had a hand with two scouts worth discarding, you probably used them by the time the event shows up. So, when you have a choice of discarding cards or losing a ton of authority, you have no choice but to lose that authority while your opponent simply discards a couple scouts. That choice is removed from you. I guess you could argue that, knowing events are in the deck you have to play your hand more carefully, but are you really going to leave 2 scouts in your hand and not buy that Capital Ship just because you MIGHT get an event? Even the positive events aren’t quite as positive for the current player. Again, these effects are more likely to happen at the end of your turn. Sure, drawing another card is nice, but you’re likely to have used all your abilities. If it just nets you more attack power, fine, no harm. But if it gives you a couple more coins to spend – which would have pushed you over the limit to afford an 8-cost base you wanted – yet you’ve already spent the other trade so you now have a worthless 2 trade, you’re not gaining as much of a benefit as someone who has an unplayed 6-card hand. I get the idea that you have to play with events in mind, perhaps hold back more in your hand than you might otherwise, or try to make all your purchases before playing all your cards. But it does seem like there’s a skewed factor involved that doesn’t really add to the fun. If I lose the game because my opponent happened to be able to afford a neat ship right when it came out, fine – at least my opponent and his luck defeated me. If I lose because an Event came out that forced me to lose a bunch of Authority because I already played my hand of cards and had no choice – that’s a lot less fun. 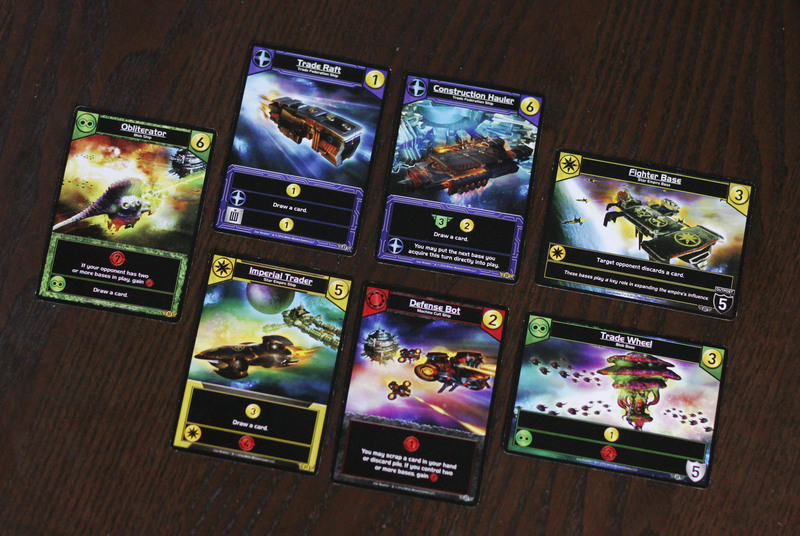 In basic Star Realms even though there is luck I always feel like I’ve been defeated by an opponent, not the game. Events change that a little bit. If that doesn’t bother you, or if you’re a completionist, don’t let me stop you from adding Events to your game. They certainly add a lot of excitement and unpredictability – you never know when an Event will really go in your favor at the right moment. Or just ruin your perfectly-laid plans. You never know. I would still mix in Events from time to time, but the other packs I intend to just keep shuffled in the deck. It’s an interesting model to sell expansions in small, cheap packs so that you can add what you want to your game. You don’t have to buy any one of these packs. You can buy all of them. Nice overview, especially as I am adding a different expansion each day this week during daily-ish lunchtime Star Realms matches. The one thing I’m confused about is what you said regarding an Event and discarding cards but having already played Scouts and having to discard another card. The Comet says you can discard from your hand or discard pile, and the Black Hole just says to discard up to two cards. So, wouldn’t you still be able to discard a card you’ve just played since they’re going in your discard pile anyway? The Comet allows you to scrap cards, which is fine. Because sure, you can scrap from your discard pile (although I’m not sure the rules are clear on when the cards you’ve played enter the discard pile… is it when you clean up your turn, or immediately? If it’s not immediate, you technically have those cards neither in your hand or in the discard pile, so if your discard is empty, it’s worthless. Regarding the Black Hole, you can’t discard cards from In Play or from your discard pile. So if you’ve played all your cards, you don’t have the choice of discarding them. Discarded cards go to your discard pile. Played cards are “in play” and are neither in your hand nor discard pile until the end of the turn, when they are discarded. (this distinction is important! If you have 4 Scouts and a Supply Bot, you may NOT play all 4 Scouts out of your hand for money, then scrap one, as they are then “in play”) Scrapped cards are removed from play permanently. With Recycling Station and Brain World in play, you can discard 2 Scouts to draw 2 cards, then use Brain World to scrap the 2 Scouts (now in your discard pile) to draw 2 MORE cards. The Star Realms app handles this perfectly, by the way. Try ignoring their suggestion and manually playing all 4 Scouts when you have no discard pile. If you then play a Supply Bot or Missile Bot, it doesn’t prompt you to scrap anything, as you have no legal targets. So I’ve definitely had this mixed up. I’ve basically been throwing down all five of my cards all at once but it sounds like I need to look at holding back cards if I want to use any abilities that allow for discarding or scrapping from my hand. Especially since nothing goes into the discard pile until all play for that hand has finished. Thanks for the clarification! The hard parts about Star Realms are that 1. almost everyone I’ve seen teach deckbuilders with starts off to the newbie: “Okay, throw your cards down on the table and let’s see what you’ve got,” so they never really get the idea of the zones of play. 2. Magic cards at least have a cost to play, so it’s kinda intuitive that they don’t DO anything till you pay for ’em.